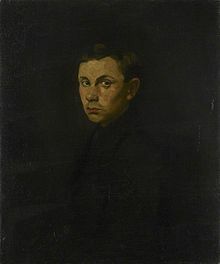 Benjamin Lauder Nicholson, OM (10 April 1894 – 6 February 1982) was an English painter of abstract compositions (sometimes in low relief), landscape and still-life. Nicholson was married three times. His first marriage was to the painter Winifred Roberts; it took place on 5 November 1920 at St. Martin-in-the-Fields Church, London. Nicholson and Winifred had three children: a son, Jake, in June 1927; a daughter, Kate (who later also became a painter), in July 1929; and a son, Andrew, in September 1931. They were divorced in 1938. His second marriage was to fellow artist Barbara Hepworth on 17 November 1938 at Hampstead Register Office. Nicholson and Hepworth had triplets, two daughters, Sarah and Rachel, and a son, Simon, in 1934. They were divorced in 1951. The third and final marriage was to Felicitas Vogler, a German photographer. They married in July 1957 and divorced in 1977. Nicholson's first notable work was following a meeting with the playwright J. M. Barrie on holiday in Rustington, Sussex, in 1904. As a result of this meeting, Barrie used a drawing by Nicholson as the base for a poster for the play Peter Pan; his father William designed some of the sets and costumes. Nicholson was exempted from World War I military service due to asthma. He travelled to New York in 1917 for an operation on his tonsils, then visited other American cities, returning to Britain in 1918. Before he returned, Nicholson's mother died in July of influenza and his brother Anthony Nicholson was killed in action. From 1920 to 1933 he was married to the painter Winifred Nicholson and lived in London. After Nicholson's first exhibition of figurative works in London in 1922, his work began to be influenced by Synthetic Cubism, and later by the primitive style of Rousseau. In 1926 he became chair of the Seven and Five Society. In London Nicholson met the sculptors Barbara Hepworth (to whom he was married from 1938 to 1951) and Henry Moore. On visits to Paris he met Mondrian, whose work in the neoplastic style was to influence him in an abstract direction, and Picasso, whose cubism would also find its way into his work. His gift, however, was the ability to incorporate these European trends into a new style that was recognizably his own. He first visited St Ives, Cornwall, in 1928 with his fellow painter Christopher Wood, where he met the fisherman and painter, Alfred Wallis. In Paris in 1933 he made his first wood relief, White Relief, which contained only right angles and circles. In 1937 he was one of the editors of Circle, an influential monograph on constructivism. He believed that abstract art should be enjoyed by the general public, as shown by the Nicholson Wall, a mural he created for the garden of Sutton Place in Guildford, Surrey. Nicholson moved to St Ives in 1939 living at Trezion, Salubrious Place, for 19 years. In 1943 he joined the St Ives Society of Artists. He won the prestigious Carnegie Prize in 1952 and in 1955 a retrospective exhibition of his work was shown at the Tate Gallery in London. In 1956 he won the first Guggenheim International painting prize and in 1957 the international prize for painting at the Sao Paulo Art Biennial. Nicholson married the photographer Felicitas Vogler in 1957 and moved to Castagnola, Switzerland, in 1958. In 1968 he received the British Order of Merit (OM). In 1971 he separated from Vogler and moved to Cambridge. In 1977 they divorced. Nicholson's last home was in Pilgrim's Lane, Hampstead. He died there on 6 February 1982 and was cremated at Golders Green Crematorium on 12 February 1982. Some of Nicholson's works can be seen at the Tate Gallery, Tate St Ives, Kettle's Yard Art Gallery in Cambridge, The Hepworth Wakefield, and the Pier Arts Centre in Stromness, Orkney. An auction record for this artist of $1,650,500 was set at Christie's, New York, for Sept 53 (Balearic), an oil and pencil on canvas, on 1 November 2011. His painting Fiddle and Spanish Guitar, in oil and gravel on masonite, was sold for €3,313,000 by Christie's in Paris on 27 September 2012. Wikimedia Commons has media related to Ben Nicholson. ^ David Boyd Haycock, A Crisis of Brilliance: Five Young British Artists and the Great War (2009), p.73. ^ Smith, Kirstie (3 September 2015). 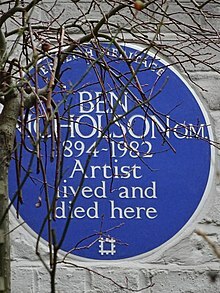 "Row over home of artist Ben Nicholson". The Cornishman. p. 7. ^ "Ben Nicholson OM 1894–1982". Tate Gallery. Retrieved 22 January 2015. ^ Sophie Bowness, Nicholson, Benjamin Lauder (1894–1982) Oxford Dictionary of National Biography, Oxford University Press, 2004; online edition, May 2010. doi:10.1093/ref:odnb/31498. Accessed 15 April 2013. ^ Lot 67: Ben Nicholson (1894-1982), Sept. 53 (Balearic) Christie's sale 2477: Impressionist and Modern Evening Sale, 1 November 2011, New York, Rockefeller Plaza. Accessed 15 April 2013. ^ Lot 87: Ben Nicholson (1894-1982), Violon et guitare Christie's sale 3538: Collection Hélène Rochas, 27 September 2012, Paris. Accessed 15 April 2013.